We arrived in Jodhpur last night and woke up early to meet Doctor S.M. Mohnot, Director of the Mine and Labor Protection Campaign. Apparently 95% of mining here is done by small privately owned groups. 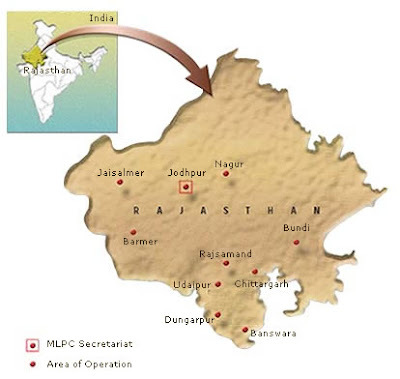 None of the mines surrounding Jodhpur are in compliance with federal laws requiring best practices and safety provisions for employees. In fact there is at least one death in these mine every day. Silicosis and tuberculosis are two of the largest issues the Mine and Labor Protection Campaign is focusing on today. Sandstone mines surround Jodhpur. There are 8,000 to 9,000 of these mines owned by the private sector which have been able to sustain a workforce due to droughts in the villages 20-200 km away leaving agricultural workers unemployed and hungry. Mining has contributed to the amount of land that cannot be used for agriculture. The natural resources in the villages near Jodhpur have been phenomenally damaged and this has left many villagers in financial crises. Mine owners often use this crisis to their advantage to exploit their employees. Miners are forced to work in temperatures up to 48C and as low as 0C. They also do not earn enough to buy nutritious food for themselves and their families. They are extremely malnourished. Employers routinely give addictive substances like alcohol and opiates to their workers to keep them working for 12 hour shifts and keep them coming back to work. Employers also give large loans to employees in financial crisis and exploit them this way. Dr. Mohnot called it enslaving people through hypnosis. India is a large country with a huge population where, according to Dr. Mohnot, the value of life is way too low. The majority of workers coming from rural areas are illiterate and undereducated. It is difficult to spread awareness of hazardous working conditions to them. He values the idea of empowering workers to take these issues on themselves and says that amongst these groups there are sensible and worthy leaders to be found to organize them and disseminate important information about rules and regulations that are not being followed. To understand the plight of these employees socioeconomic, environment, and political climate in the region all must be taken into account. Economic needs should be balanced with ecology, local fruits, local milk, good water and pollution control. I asked about the education of medical professionals and he agreed with Dr. Joshi's analysis that most physicians do not diagnose patients with occupational illnesses because they can't recognize them. Most silicosis patients are treated for tuberculosis. He said they needed a standardized method to diagnose silicosis which they currently do not have. I asked him about my plan to promote materials coming from places of work that are using best practices and creating safe work environments. He said the European Commission started something like this but did not follow through. The Netherlands for some times was only importing stone that was mined without child labor and was largely effective at reducing the number of children employed. But this needs to be a collaborative effort. I like Dr. Mohnot. His determination is inspiring. He views mining in Jodhpur as a human rights violation which should not be ignored. I also noticed him turning off lights and fans in rooms that were not being used and encouraging people to walk rather than use their cars. He booked us at a hotel close to his office and took us out to a modestly priced lunch. He clearly understands the value of little things. He has noticed the effect climate change has had on the desert villagers of Rajasthan and makes changes in his own life accordingly. I plan to spend more time with him visiting nearby mines and villages this week.